I noticed an article in the Sydney Morning Herald last week where the word ‘sgraffito’ was used – correctly – to describe ornate plaster work that has been uncovered during the restoration of Glebe Town Hall in Sydney: Peeling back the layers to reveal Glebe’s true history. Sgraffito is a centuries-old decorative technique used on ceramics and plaster walls. Apparently when Glebe Town Hall was built 130 years ago, artisans used this technique to carve a pattern in still-wet white plaster to selectively reveal the pink plaster below. 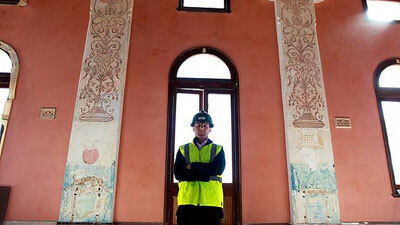 City of Sydney’s architecture design manager, Chris McBride, with the examples of sgraffito discovered at Glebe Town Hall. 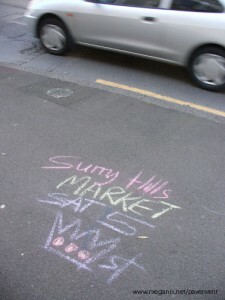 Photo: Ben Rushton (Sydney Morning Herald, 18 July 2012). The word sgraffito (plural sgraffiti) comes from the Italian word graffiare, meaning ‘to cut or scratch in stone’. It seems to have been used in the English language in the 18th century to describe incised pottery, but by the 19th century the word graffito (plural graffiti) was being used to mean the kind of casual wall writing that had survived at archaeological sites in Italy (including Pompeii), Egypt and Syria, for example, or on churches and other public buildings in Europe from the Middle Ages. 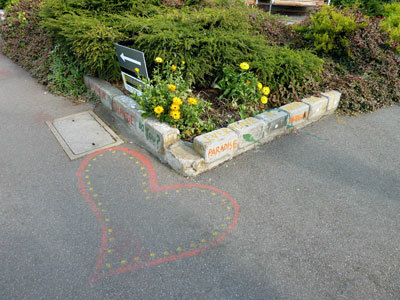 Graffito/graffiti was not used in the English language to refer to contemporary inscriptions until later in the 19th century, but even so, in this sense it remained an infrequently-used term until the mid-20th century. Scholarly interest in the writing on toilet walls seems to have popularised the term in the 1960s and 1970s. For my own project I have been trawling the digitised newspapers on the marvellous website Trove, looking for early examples of pavement graffiti in Australia. 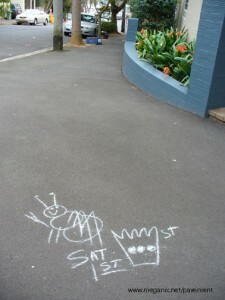 I have found plenty, but not by searching with the term ‘graffiti’. 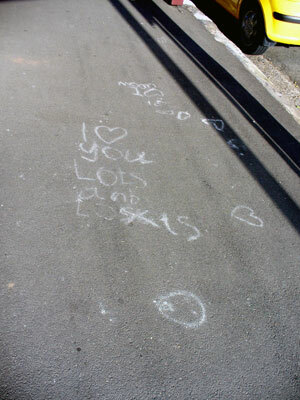 I had to use search terms like ‘pavement writing’ or ‘footpath writing’. Until the 1960s the word ‘graffiti’ does not appear in Australian newspapers except in occasional news items about archaeological discoveries. 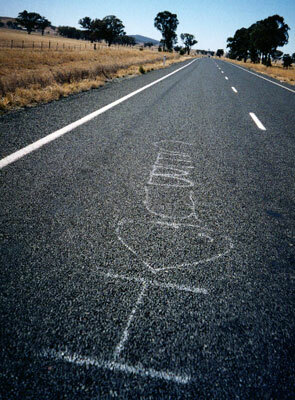 One of the earliest references to modern graffiti that I found was in a travel article in the Australian Women’s Weekly (!). Journeying through Hungary in 1969 the writer notes that she saw ‘modern graffiti slogans about American aggressors in Vietnam’ on a wall in one village. By the way, the story goes that when George Lucas made the coming-of-age movie American Graffiti (released in 1973, set in 1962), Universal Pictures objected to the film’s title, not knowing what ‘American graffiti’ meant. Lucas is said to have been dismayed when some executives assumed he was making an Italian movie about feet. Although over 60 alternative titles were suggested, Lucas prevailed with his original choice. 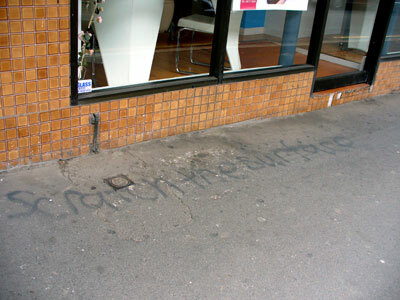 ‘Scratch the surface’, King Street South, Newtown (Sydney), 2010. David, Bruno, and Meredith Wilson. 2002. 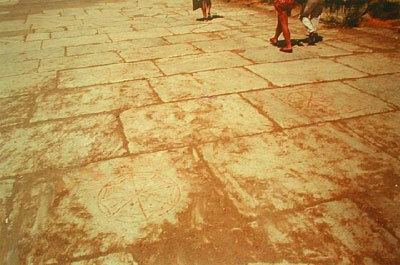 Spaces of resistance: graffiti and Indigenous place markings in the early European contact period of northern Australia. In Inscribed Landscapes: Marking and Making Place, edited by B. David and M. Wilson. Honolulu: University of Hawai’i Press. Fleming, Juliet. 2001. 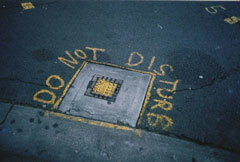 Graffiti and the writing arts of early modern England. Philadelphia: University of Philadelphia Press. Reisner, Robert. 1971. Graffiti: two thousand years of wall writing. New York: Cowles Book Co., Inc.
‘American Graffiti’, Wikipedia, 23 July 2012. 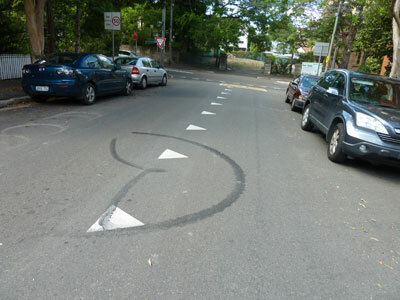 There is an ongoing battle between cyclists and just about everyone else – motorists don’t want them on the roads, pedestrians (like me) don’t want them on the footpaths. The issue is a perennial filler for Sydney newspapers and has flared again this week in news stories, opinion pieces and letters to the editor. 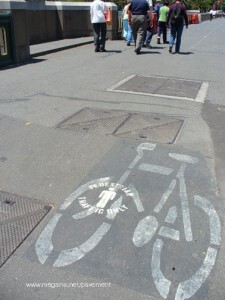 In Australia, those who argue on the cyclists’ side point to the way in which cities in other developed countries have embraced the bicycle – but it’s not necessarily all plain cycling overseas. Apparently one of the great battlefields in the war between bicyclists, pedestrians and motorists is the Brooklyn Bridge in New York. Robert Sullivan, calling for an armistice, writes in the New York Times: “The stripe painted down the center of the elevated Brooklyn Bridge walkway, to separate bicyclists from pedestrians, has become a line in the sand. 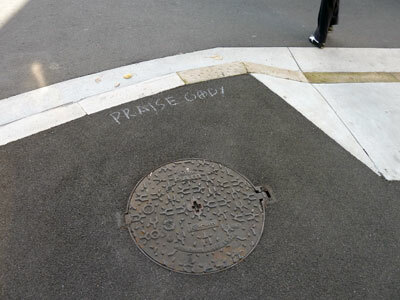 We need to erase that line once and for all.” Here is an example where the record of a territorial struggle has been written on the pavement itself. 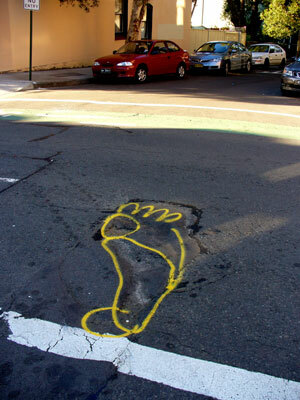 Almost every sign, symbol, graphic and graffiti marked on the roads and sidewalks is a claim for territory. 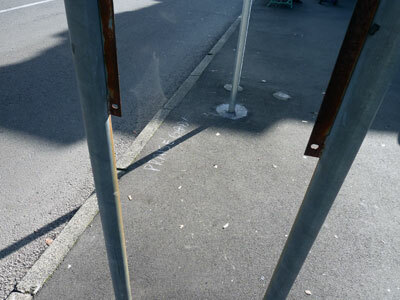 The two examples photographed for today’s blog record instances where pedestrians have had a victory over cyclists, officially at least, and probably only temporarily. 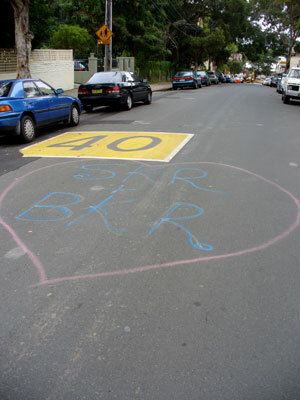 The ineptly obliterated bicycle symbol overpainted with a ‘Pedestrian traffic only’ stencil was on the bridge at the corner of St Kilda Road and Flinders Street in Melbourne in 2005. 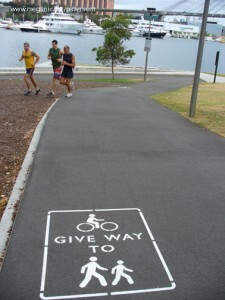 The ‘Give way’ stencils appeared in parks in the City of Sydney towards the end of 2008 after many complaints from pedestrian park-users.